The VCMC Motorsport Club was one of the first Canadian clubs to use MotorsportReg.com, even before we built Canadian dollar functionality. Based out of Vancouver, BC, they have a strong and growing program with a very holistic view on how to nurture people into passionate, competitive drivers. Carol Wong has been involved with VCMC for the last 12 years. She started out as a novice autocrosser and later joined the executive team as the Treasurer. She’s recently started doing lapping days and is now in her first year of club racing and endurance road racing. When she’s not volunteering for VCMC, she works as a software developer. We recently chatted with her about what it takes to run awesome events. MSR: What types of events does VCMC run? Carol: VCMC mainly organizes autocross events. We host a major 3-day Super Challenge autocross event each year which is usually the largest solo sport event in Canada. Our Velocity Driving School is one of the longest running programs of its kind in Canada. VCMC also runs several lapping days during the summer. Carol: We have a really diverse membership with many enthusiastic new members joining us each year. We have members who have been with us for decades and who still volunteer at special events even though they may not be active in the sport. Many lifelong friendships have been formed through VCMC. We are a fast and competitive bunch too! Our members collectively hold the most regional and national level solo championships of any club in Canada. Some have continued to win in other forms of racing too-even at the pro level. 2013 has been an especially big year for our members. 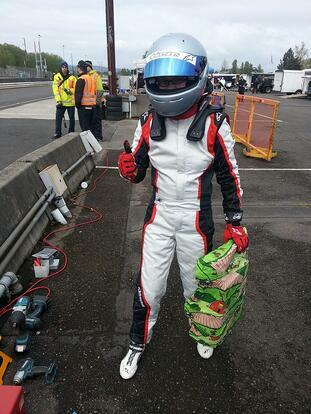 One of our club members won the overall Canadian Autoslalom Championship. Our club's Scion Tuner Challenge team competed in the Pikes Peak International Hillclimb, and they won several recent events in the Scion Tuner Challenge to pull themselves into second place in the challenge. We also had an alumni member drive in the 24 Hours of LeMans and win 2nd place in the GTE class. One member just brought home a trophy from the SCCA Solo Nationals. Plus several club members have been competing and winning in ChumpCar endurance races. Carol: We're really good at running major events. Our annual 3-day Super Challenge event has become a must-attend for many seasoned autocrossers, drawing many competitors from out of town. And this year we hosted the Canadian Autoslalom Championship, which is the highest level of solo sport competition in Canada. We're also good at getting a lot of exposure for solo sport by meeting with the general public at auto shows and by soliciting support from industry. Carol: I've met a lot of great people through motor sport. I have friends all across the continent whom I've met through racing and some of my best friends are fellow VCMC members. Motor sport is such an important part of my life that it's hard for me to imagine not being involved with the organization. The team that manages the club is enthusiastic and passionate about the sport. Being able to work with a great team and organize events for my friends to enjoy is what motivates me. Carol: The biggest lesson I've learned (and am still learning) is to delegate! Most people are willing to help out in some capacity. While not everyone wants to commit to a role or title, many are willing to take on small, focused tasks. All you need to do is ask. The more small tasks you delegate, the easier it is for you to run a great event. Also, don't take negative feedback or criticism regarding the event personally and don't get discouraged. Boil the criticism down to just the raw facts and plan on improving for future events. MSR: How do you promote your events? How well does that work? Carol: Our club website remains our main tool for promoting events. We have a very active web forum with thousands of registered users. Many club members visit the forum daily. In the past we've also posted event info on other car enthusiast web forums. We still use them to some degree, but Facebook is quickly becoming one of our biggest promo tools. Our Facebook page has over 400 followers. Carol: Pre-event organization has been way easier now that everyone can pre-register and pay ahead of time. The reports are a god-send for a treasurer (me) who likes to procrastinate and leaves post-event bookkeeping for many months after. Carol: Design-your-own-forms. No more waiting around and back-and-forth emails with a form designer who doesn't really understand what you want. The payment and refund handling has been very smooth. I love being able to see important info via the Dashboard. My favorite feature: It just works! MSR: Carol thanks for chatting with us! VCMC was formed in 1982 with a vision to promote motorsports and high performance driving. It was the first Asian-led motorsport club in North America. The club is very active in promoting and supporting the well-being of the motorsports community. Anyone and any car can join! The club's philosophy on speed is that the driver is the main ingredient for success regardless of what modifications are made to the car. If you are unable to make use of the full potential of a car off the showroom floor, then how can you expect to master a highly modified purpose-built racing machine? If you live in Western Canada or the Northwestern United States, join VCMC in adrenalin pumping, heart pounding motorsports fun. For a complete listing of all of their events, check out their calendar.